We offer what pet store chains, supermarkets & warehouse stores don't. And in addition to selling the best products, where else can you get answers to important pet care questions? Like how to keep your dog from getting bored. Or knowing the best products for flea & tick protection. Or who’s the best dog trainer? Or the best boarding facility? I’m here and I know the answers. Located on Kanan Rd., just north of the 101 freeway, Love’s Pets serves the communities of Agoura Hills, Oak Park, Westlake Village, Thousand Oaks…in fact, the entire Conejo Valley. And because the store is freeway convenient, people who care about their pets don’t mind driving a little further to shop at Love’s Pets. Meet me! I’m Larry Horn. I’m the owner of Love’s Pets. 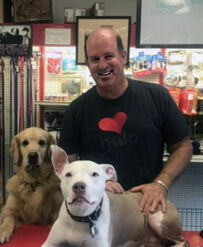 And I’m in the store every day, helping customers provide the very best care for their dogs. Pets are my passion and so I’m constantly searching world-wide for the best all-natural and holistic foods & supplies. That’s why it’s not unusual for Love’s Pets to be the only store on the West Coast carrying certain specialty foods and supplement brands. We only sell the highest quality, all-natural products, proven to boost your dog’s energy and longevity. And of course, our prices are very competitive…even on these specialty products. If they weren’t, I wouldn’t be in business for long.